On my return to Algeria, after five lonely months spent in Britain, we celebrated our reunion by dining out that same evening at one of Oran’s many restaurants. I was in a state of euphoric relief, almost dizzy with it. 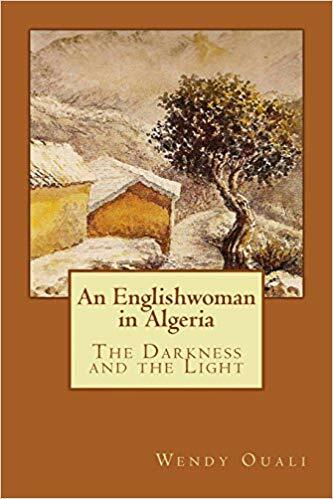 Although only a few hours had passed since I had set foot back in Algeria, I felt as though a great weight had been lifted from my shoulders. There was no trace of the panic attacks from which I had been suffering during our separation. They had come upon me suddenly, almost as if I had willed them into existence. My breathing would become rapid and shallow, my heart hammering inside my chest, and I would feel as though I were about to black out. But they seemed to have disappeared as suddenly as they had appeared. It was as if I had just awakened from a long coma. My eyes and ears had finally opened to let in the explosion of colour and noise that was Algeria. Every sense was heightened. I had noticed for the first time that afternoon when I had arrived back in T’s flat on the eighth floor of the Cité Jeanne d’Arc, how the brilliant sunlight, flickering through the slats of the blinds on the curtain-less windows, painted a tiger pattern of alternate dark and light stripes on the tiled floor. I could hear every sound, from the cries of the children playing outside, to the plaintive call to prayer stealing into the room through the open window like a secret lover. My skin could feel the warm caress of the evening sun as we strolled along the pavement a few hours later, my step light and carefree — I could smell the delicious aroma of grilled seafood as soon as we walked through the swinging door of the small restaurant hidden somewhere down a side street in the city centre. The restaurant was full. Looking around with curiosity at the busy tables, I noticed an old couple bent over their meals, eating side by side without exchanging a single word. A group of young women in their twenties collapsed into helpless giggles as a stern man, dining alone nearby, gave them furtive sideway glances as he noisily slurped down his soupe de poissons. The noise level was high. The smoke level, too. But it didn’t bother me. T waved to a group sitting around a rough deal table covered with oilcloth and littered with prawn shells, discarded chunks of bread and ashtrays filled to the brim with cigarette butts. It turned out that they were our neighbours, two of his fellow engineers at the ammonia plant, with their wives — one American and the other from Constantine. The American wife, blond hair cut short and cigarette waving from her fingers as she chattered loudly in American-accented French, stood out in sharp contrast to the other, whose dark hair was pulled back from her jolie-laide face in an elegant chignon and whose quiet demeanour belied a sharp sense of humour. The waiter, a large white apron tied around his waist, and forehead shining with sweat from the heat of the kitchens, appeared out of nowhere, bearing a large platter of grilled prawns and langoustines, decorated with pale rings of fried calamari, and accompanied by bowls of crispy golden chips and green salad, glistening with olive oil. Licking the garlicky juice from my fingers, I can remember thinking to myself that it couldn’t get any better than this. In later years, we would drive down to Oran to have dinner at another small restaurant called Chez Mémé (At Grandma’s House). Chez Mémé didn’t go in for such newfangled nonsense as a menu — you had the choice between two main dishes, along with the same number of desserts and entrées. The restaurant – basically just an upstairs room over a shop, was filled with two tables, each one large enough to seat a dozen customers. No such thing as an intimate table for two there, but the food was sublime. At other times we would have dinner at the Passerelle restaurant in Arzew. La Passerelle, Arzew’s best and most expensive restaurant at the time, was situated in an idyllic spot called la Fontaine des Gazelles on the coast road. It was owned by a Kabyle chef rejoicing in the exotic name of Désiré — not, I hasten to add, his real name. He was actually called Mohand, or something similar. The dining room of the Passerelle extended out over the beach, supported by piles driven into the rock. It had wide plate-glass windows on three sides, though which the sunlight poured, reflecting off the snow-white table linen and making the glasses and the silverware sparkle. Whenever we decided to treat ourselves to a meal there, I would look forward to it for days, my mouth watering in anticipation. I could already taste the hors-d’œuvre variés and the steak au poivre cooked in cream and crushed peppercorns, then ceremoniously flambé-ed with brandy in front of me on a portable copper burner. To round it all off, there would be a meltingly delicious omelette norvégienne. Désiré was a world-class chef. Other restaurants opened in Arzew – Les Palmiers, located just opposite the seafront, where I would sometimes go with my colleagues from work for a rowdy, wine-soaked lunch, and later on Les Gazelles, a few hundred yards from La Passerelle. Lunch with my colleagues at Les Palmiers. I am third from the left. Sometimes, if we felt in need of a more elaborate dining experience, we would treat ourselves to a meal at Les Ambassadeurs, the restaurant in Oran’s Royal Hotel. Food shortages were already beginning to make themselves felt, but the food in the hotel restaurant was as delicious as ever. The only downside was one of the waiters. He was Kabyle and when he learnt that T was one of his own, he would greet us with a broad grin, slapping T on the back, or what was worse, embracing him, and calling him “DaOuali”, which is the height of respectful deference in Kabyle society. The thing was, that, in spite of all his overwhelming goodwill, he was terrible at his job. He would take our order with all the efficiency of a toddler tying its shoelaces while still wearing its mittens. He seemed to forget what we had told him before the words had even left our lips, so that we had to repeat everything so many times it became absurd. He had the air of a person in shock, of someone whose brain was engaged somewhere else, wrestling with some unseen issue. Whenever we’d ask him to describe a new dish on the menu, he would take on the look of a startled rabbit, and then start gabbling away so fast, one word would run into the next. When he’d finish speaking, we’d be none the wiser, but would nod politely and order something else. Then, looking relieved that the ordeal of taking our order was over, he’d rush back to the safety of the kitchen, almost tripping over another patron’s foot in the process. He was like an Algerian Frank Spencer. I must admit we began to avoid Les Ambassadeurs so we didn’t have to suffer him constantly hovering around our table. It was not without a pang of guilty conscience, however, as his good nature and eagerness to please were like those of an over-enthusiastic puppy. So it was that, a few months later, we decided to try out a new restaurant that was offering traditional Algerian cooking — something of an innovation. Walking into the restaurant, we gazed around with approval at the round brass tables, the hanging copper lanterns and the colourful woven blankets displayed on the walls. Suddenly, from the shadows at the back of the restaurant came a familiar cry, “DAOUALI!” At my side, I could feel T stiffen in disbelief, for there, bearing down on us, a beam of pure delight on his face and his arms outstretched in welcome, was our waiter. There is a famous quote from the fables of Lafontaine: “On rencontre sa destinée souvent par les chemins qu’on prend pour l’éviter.” (One often meets one’s destiny by the roads one takes to avoid it). Lafontaine never said a truer word. This entry was posted in Algeria in the Eighties, Arzew, Food, Oran and tagged Algerian food, Food shortages in Algeria, La Passerelle Restaurant, Oran, Panic attacks, Restaurants in Oran. Bookmark the permalink.